All too often we accept, as fact, the basic historical and genealogical truths of alleged experts without question. As we begin our search, let us consider the evidence with an enquiring mind. Above all, enjoy the adventure as you search for your roots/origins. The newer settlers were most likely an emerging society of Bronze Age warriors, who emigrated to the British Isles from central Europe about 1,000 years BC. An analysis of the "beth luis nion", their "alphabet", which was based upon the names of 20 plants [mostly trees], indicates that the Rhine River valley best represents the area where the plants of their Ogham pre-Celtic language existed. As skilled sea-farers, these Pictish people could have used the Teutonic term “Ross” to describe the shape of the coastline of Easter Ross (with Loch Eye exactly where it should be on a “noble steed”). I shall not speculate further about the origins of the Gaelic term “Ros”, meaning a promontory or headland, other than to say that the sagas of the Norse Vikings also refer to the land of Ross. According to my professor of German (Dr. R. Arnold) at Victoria University, the ancient German (Teutonic) language had a phrase “Ross und Ritter”, which roughly translated as “noble steed and rider”. Note the horse from a Pictish Symbol Stone, the shoreline of Easter Ross with Loch Eye in place, and a picture of Man o’ War. As skilful sea-farers, I suggest that the Picts used the word “Ross” to describe the land’s coastline and that it may have been borrowed by the Scots as a more generalized term “promontory”. [E.g.- The English “curfew” came from a French phrase meaning to “cover the fire”. Over the years, it has developed into a word with a different significance.] The developing languages of the neighbouring cultures influenced each other. Since my early notes about “Ross und Ritter”, I have learned that the word horse appeared as "hors" in Old English (c. 825) as well as in Old High German, the oldest Teutonic forms and Norse. The modern Dutch, like the cockneys, call it ors, and I must point out that the Teutonic word begins with an aspirate h - - - pronounced exactly like ors. It is no co-incidence that these same three letters are found in the name Ross. Do NOT pay for a "family coat-of-arms", which doesn't belong to you, unless you belong to the family of a Chief of the Clan. Beware of carnival hacks, who promise your family history for a paltry sum of a couple of bucks. You can discover much more on your own. The discovery in 1953 of the Deoxyribonucleic Acid (DNA) biochemical molecule at the base of all life has led scientists along two paths. One path looks for markers which indicate an individual’s propensity for baldness, blue eyes, or certain diseases; the 23andMe DNA tests may be better for those interested in biotechnology and gene therapy. 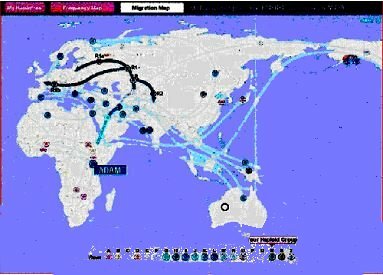 In searching for one’s roots, the test for Single-Nucleotide Polymorphism (SNP) markers at Family Tree DNA may be more appropriate; maps showing migration routes of different Haplogroups are provided. Commercial interests aside, an extraordinary east-west genetic divide or dichotomy was discovered in northern Scotland by Edinburgh University’s Dr. Jim Wilson and St. Andrews University’s Alistair Moffat. Not only did the study seem to reveal proof of the ancient movement of people from Ireland to Scotland within the genetic signature, but they also concluded that “as many as 40% of the population on the Western Isles could have Viking ancestry, while no Viking ancestry was found in north east Scotland”. In other words, they believed that they had discovered a representative/characteristic symbol of the Scottish genealogical heritage of groups such as Clan Ross. Is it possible that they had merely found a common ancestral source? It is very true that there was very little intermarriage between Vikings and the tribes of Easter Ross. Most of the interaction was on the fields of battle. In 84 AD, the Roman Historian Tacitus, son-in-law of Agricola, observed that because of their reddish hair the “Caledonians” must have originated in Teutonic Germany. Nigel Trantor, a more recent historian, noted in his Robert the Bruce: The Path of the Hero King pp. 56-62 that the Earl of Ross maintained a fleet of galleys, and most of the red-haired Rossmen carried dirks and targes which originated during the Bronze age. The topic of genealogy may be overwhelming to some, but it is worth your perseverance. New discoveries are yet to be made, and many have advised us that "knowledge is power". I believe that this concept originated with the Elizabethan philosopher, Sir Francis Bacon (22 January 1561 - 9 April 1626), who also outlined the basics of scientific enquiry. So, by all means get your family tree in order by first contacting close relatives; join associations and groups with similar interests; share your enquiries and files in a "Family History" publication; hire expert genealogists if you must. After all, what is your ultimate goal if you are interested in your roots? That's a question which only you can answer. In the previous article, I concluded with the obvious suggestion that anyone should get the family tree started by first contacting one's close relatives. This applies whether or not you are focussing solely upon the Rosses in your background. In fact, you are bound to discover that many of your ancestors are not of that ilk because of marriage. You would be wise to get organized before you get too far along in this adventure. 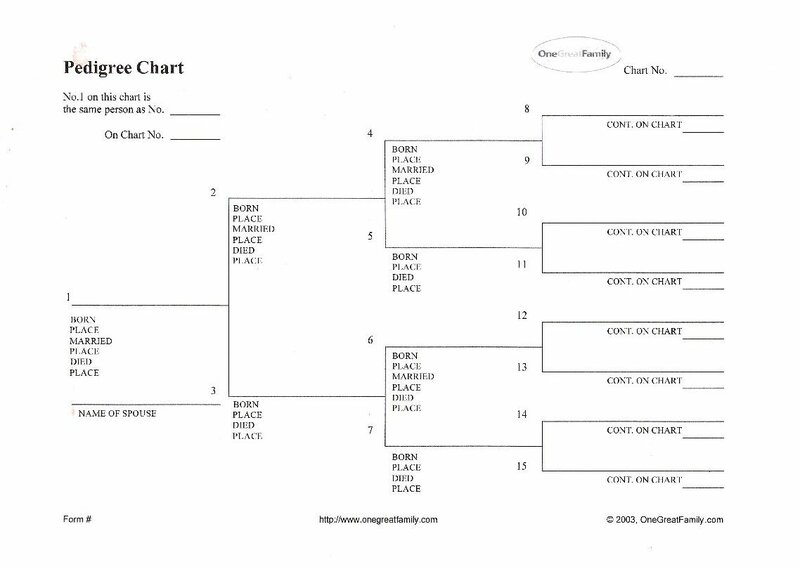 Most persons find that Family Group Sheets and Pedigree Charts are invaluable. Both of these devices aid in the collection and recording of facts: birth, birth place, marriage, marriage place, death, death place and relationships. Don't forget to keep the name and address (snail mail and email) of your source for the facts. 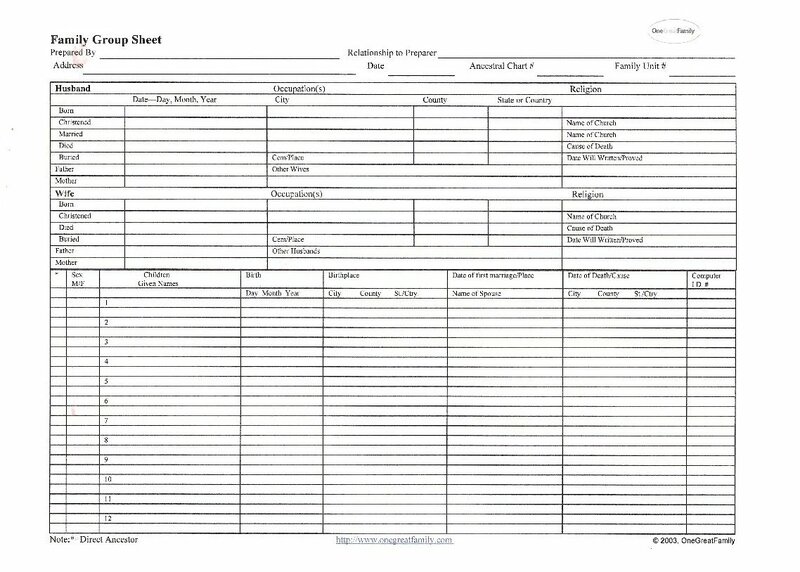 For various other professional record-keeping charts, please see the assortment at Ancestry Charts. Start by labelling those distant branches as A, B, C, D, E, F, G, H, etc. Then, within each branch, number the children in order as 1, 2, 3, 4, 5, etc. , although you may wish to "invent" numbers for 10 (x), 11 (e), 12 (t), 13 (r), 14 (f), and 15 (v) when you encounter an exceptionally large family. The system of cataloguing continues in a similar manner. For example, the third child in Branch C is identified as C3, and her children will be labelled C3A, C3B, C3C, C3D, and so on. These identifying labels will serve as page numbers when you arrange families into binders for each Branch. Have you been collecting family tales and anecdotes during this adventure? Undoubtedly there will be a few photographs, maps, letters, book reports and newspaper clippings to add to the bare bones of names and dates. It helps if you keep a record of the source for your material, because you may consider writing a Family History at this point. Perhaps the most important tool of a researcher has been left to the last. Make sure that you share your collected material with others. By casting that net far and wide, you will be rewarded. There is a saying, "As ye sow, so shall ye reap." Attend those Family Reunions. There is no better place to advertise what you are doing in person. Make sure that you contribute something in return for the information you will receive. You might also consider Update Notes or Annual Newsletters. If your research leads you to explore Clan history, attend some Scottish Festivals and join the Clan of greatest importance to your work. Consider some token of appreciation for any help you receive. If children are involved, Universal Clan Passports make suitable gifts, because they may be used at any Scottish Festival at any time; you may find simple instructions at . Your local library can search the Canadiana collection of family histories and manuscript holdings. The Ontario Genealogical Society has a large number of old maps and atlases as well as microfiche records of Latter Day Saints collections of Census, Birth and Marriage Records. American sources include collections at the Library of Congress in Washington, DC, as well as State and Local institutions. Oxford University has a summary of Western Manuscripts and the Bodleian special collection. Register House in Edinburgh holds most of the Parish Registers of Scotland. Census Records - read a description of the kind of data collected; some surprises! Passenger Lists - Immigration data, National archives, Port of Quebec, etc. Today's serious genealogist takes advantage of today's technologies . . the Computer and the Internet. The Computer is a valuable device for storing, sorting and searching data. The Internet helps you to share the wisdom of others who are performing similar tasks. For example, almost everything that has been provided thus far (other than actual experience) may be found on my website. GEDCOM, GEnealogical Data COMmunication, is a file format developed by the family history department of The Church of Jesus Christ of Latter-day Saints (L.D.S.). It has become the universal standard for arranging and transferring genealogical data. DNA, deoxyribonucleic acid, is the carrier of genetic information for all living things. An analysis of your DNA may uncover distant relatives with whom you share a common ancestor. These "cousins" may not even be recorded on your charts. When your family tree gets too large to handle, you should consider an internet program in order to take advantage of the work which other genealogists may be doing. The best program, in my humble opinion, is My Heritage Family Tree. The Premium Plus version of My Heritage is a good investment, since you may invite relatives and others to become members of your website space. The program has several features, including monthly email updates to members about any changes or additions you make, easy printouts of your family tree, tools to search the internet for records about any individual, GEDCOM formatting of your tree for transferring data to other sites, photo storage as complete as you wish, regular notices about smart matches and discoveries about other trees linked to yours. In conjunction with this program, I also use Google to check place names and locations. Incidentally, you may discover that some family trees may rely upon census records for the year of birth, and these dates could be inaccurate by a year or so. Remember the saying: old genealogists never die; they just lose their census.